Shin splints is a very common ailment that affects athletes but can also occur in the non-athletic individual. It is an inflammatory condition occurring either in the front of the lower leg or in the back. The cause for each is different. Typically, with this type of symptom a person will be doing some kind of athletic endeavor (walking a long distance would qualify), and begin to notice a soreness in the lower leg, either in the front or back of the leg. The more the person moves the more the condition worsens. Should the person stop, the pain will diminish somewhat only to worsen once the activity is resumed. Anterior shin splints, or pain in the front of the lower leg, may be more prevalent running on hard surfaces, or running or walking down hill. After the heel hits the ground, in gait, the foot should slow down in order for the front of the foot to hit the ground. People with a tight heel cord (Achilles tendon), do not allow the foot to slow down so the muscles that control the forefoot and originate in the front of the lower leg are forced to overwork. 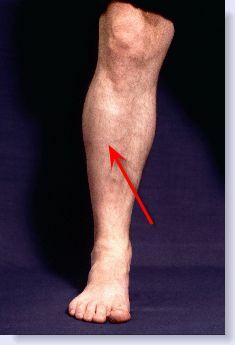 This overworking of the muscle causes the muscle to swell and since the muscle is in a confined location in the lower leg, the swelling causes pain. Posterior shin splints generally occur in people who are moderately to severely pronated or more commonly known as flat footed. 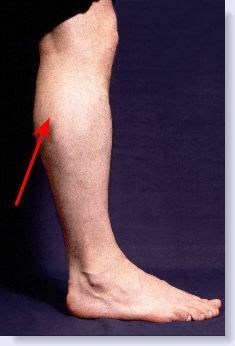 People who exhibit this type of foot structure force their feet to overwork, thus causing the muscles in the back of the lower leg to also overwork. Again, this overworking causes the muscle to swell and since it too is in a confined space, pain will occur. SYMPTOMATIC TREATMENT of the condition is through the use of icing the area and taking anti inflammatory medication such as aspirin, Aleve, Motrin, Advil, etc. Also, avoiding the type of walking surface that caused the problem would be indicated. This is acceptable treatment for the short term, but not considered a solution to the problem. PERMANENT SOLUTION is to have your feet examined by a foot specialist to determine the type of foot structure you exhibit and thus find the cause of the problem. Generally, an orthotic, usually a prescription type of device will be indicated, but certain individuals may also experience relief with an over the counter type device. Look at the bottom of this page for my recommendations in an over the counter orthotic. The purpose of the orthotic is to either reduce pronation in those with posterior leg pain or to reduce the strain on the Achilles tendon in those suffering from anterior leg pain. In addition to an orthotic, the athletic individual should also examine his athletic shoes as there are various types of shoes on the market, many of which may help correct the abnormality in the foot structure and thus relieve the symptoms. The non athlete should also examine his or her shoes as flimsy type shoes may exacerbate the abnormality in that person’s foot structure and bring about the pain associated with shin splints. Other conditions that may mimic this condition include stress fractures of the lower leg, along with muscle tears. Anyone who is suffering from this problem that do not respond to the above mentioned treatments should consider having an MRI to rule out these possibilities. Periostitis which is an inflammation of the periosteal tissue that surrounds bone. This condition tends to be more chronic and will not respond to biomechanical changes applied to the foot. Lastly, a condition that mimics shin splints but has the potential for more serious consequences is known as anterior compartment syndrome. It is basically a more severe form of anterior shin splints, however, in this case the excessive swelling of the muscle will cause excessive pressure on the nerves resulting in numbness in the area and weakening of the muscles into the foot. Equally important, the blood supply in the affected area is cut off. The patient will complain of numbness in the foot and leg, along with pallor (due to the circulation being cut off), along with excessive pain. The major causes of compartment syndrome include: fracture of the lower leg, a soft tissue injury of the lower leg, an arterial injury and severe burns to the leg. This situation will not respond to icing and anti-inflammatory medication. In these cases a fasciotomy (incising the surrounding connective tissue underneath the skin) must be performed to reduce the pressure. This is considered a medical emergency and immediate medical care is indicated. Go to anterior compartment syndrome for more complete details.